For the humorless amongst you who didn't find these Updated for 2011 - McDonald's WiFi Guide with updates for Mac OS X Lion and Windows 7 to be HIGH-LARIOUS, the question was asked, "well, sir, how do you connect to a Wireless WIFI Network from the Command line in Windows 7?" You can set these up and refer to them by name from the command line, or a batch file, etc. Nice to do for the places you are regularly. 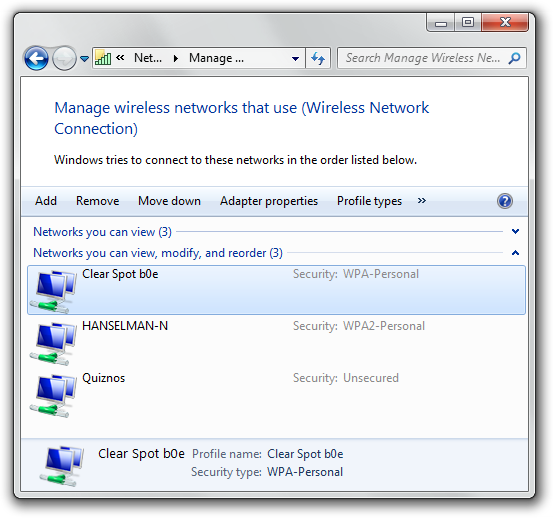 netsh wlan connect ssid=YOURSSID name=PROFILENAME interface="WIRELESS NETWORK CONNECTION"
All this command line love will work in most versions of Windows, actually, not just 7 AFAIK. There's lots of more detail and docs on managing Wireless Profiles on the Web. Maybe this is a dumb question, but what if you have a password on your access point? Will it prompt you? Funny. My first reaction on reading all that command-line for OS X was to check netsh wlan. The latter option gives more detail including signal but (doh!) in some arbitrary percentage not in dBm. On a related note, I was shocked to hear Leo and friends on MacBreak Weekly actually laugh about this McDonalds card about how much easier it is to connect to WiFi with a Mac. OMG - Leo and Friends. Sigh. this is for connecting to wireless connections you already have set up.. exactly as Scott is saying this is for profiles that already exist. netsh wlan add profile filename="<xml file of config>" interface="wilress Network Interface" User="username"
dunno the format of the xml file.. So not so easy or am i totally wrong? dunno if you can generate that is some way? i get the useOneX being false tells it to set up the shared authentication stuffs? Sadly this does not work for XP. wlan is not a known netsh command. Works very nicely in >= Vista though.